Wrightwood is a magical place free of chain restaurants and as such we ended up trying out many different places to eat. But we only went to one place twice – Evergreen Cafe. Now, it did help that Evergreen Cafe was around the corner from our hotel. Easy to walk to for a big breakfast before a day in the snow, and once we had breakfast, we felt we really needed to try it for dinner. The portions are huge like they are all over Wrightwood, but the prices are good, and the food is fantastic, old-fashioned cooking. For breakfast, I got corned beef hash and eggs, which also came with a GIANT pancake that I gave most of to David. The corned beef hash tasted like the kind I used to eat when I was a kid – all mashed up with lots of potatoes, not too spicy and not loaded down with green peppers (my main issue with most hash served in OC). 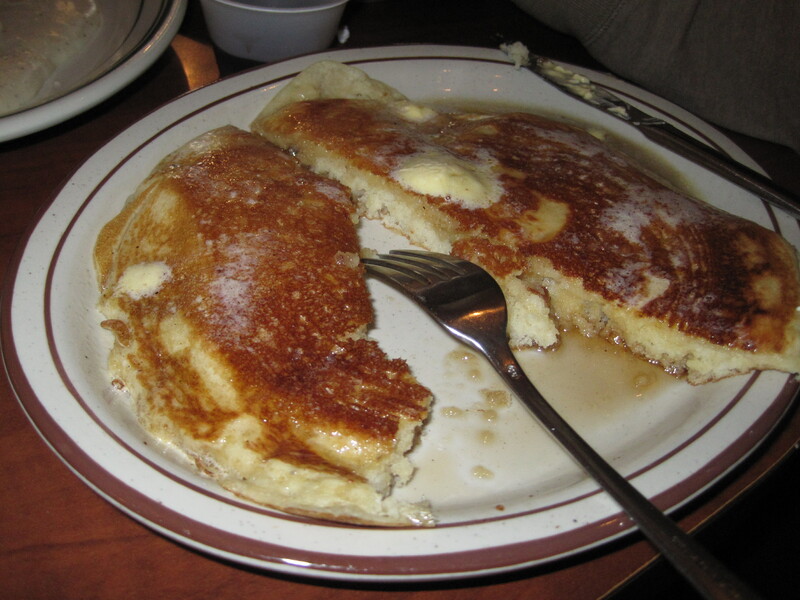 The pancake was thick and fluffy and really could have been a meal unto itself. David got the biscuits and gravy, which were also tasty and would probably make Puala Deen proud. The little one got a meal very similar to a Denny’s Grand Slam, and was about the same size. We had no hope of finishing it all, but we sure tried. Which is okay, because that was followed by several hours of climbing snowy hills, hiking around looking for the perfect sled spot, and having snowball fights. For dinner, we came back, not just for the food, but also because the place feels very warm. The staff is very friendly and make you feel like friends visiting for the weekend. And the decor they had up for Valentine’s Day was pretty funny – they had XL sized Valentine’s Day themed boxer shorts hanging from the ceiling on fishing line attached to the front door, so they moved up and down whenever someone came in or out. 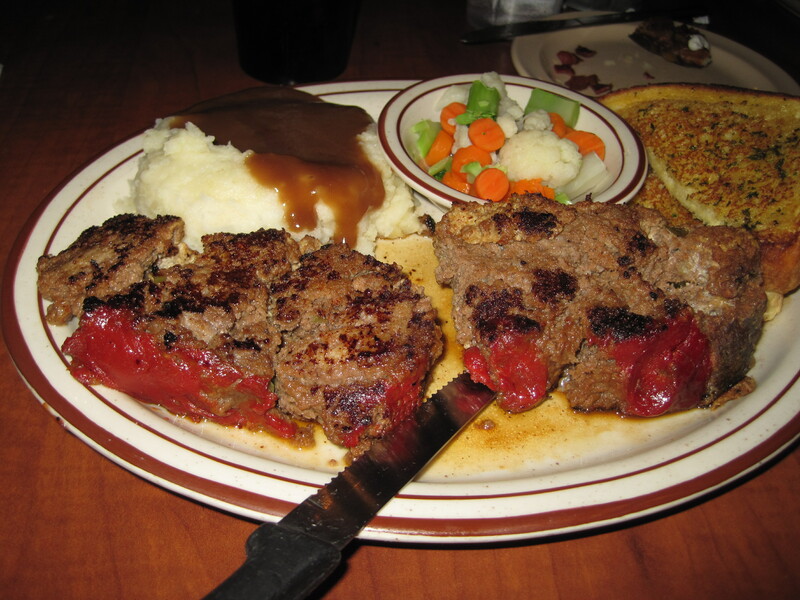 For our meal, we went for old-fashioned diner favorites – I got meatloaf with mashed potatoes and David went for a second round of gravy with fried chicken breast coated in the stuff. Both were tasty comfort food that hit the spot after an active day. Once again, we did not finish, but we’d kind of given up on that by this point. We probably could have shared an entrée, but I’m not a fan of white gravy, and David isn’t big on meatloaf. The little one had a respectable bowl of spaghetti. Compared to Grizzly Cafe, Evergreen had better prices, but then it was more diner than bar and grill, so perhaps it is to be expected. When we return to Wrightwood, this will absolutely be at the top of our list of places to eat. It’s tough competition with Egg and I and Original Pancake House, but the pancake was EPIC. Much like Egg and I, though, it is geographically challenged to compete for our affections.